Conveniently located en route from Jaipur to Udaipur, Shahpura Bagh is a perfect retreat to take a break from a busy Rajasthan tour. This boutique heritage homestay offers nine suites set in 40 acres of nature yet within walking distance of the local village of Shahpura. The magnificent pool has cabanas for lounging and is the perfect place to recharge mid tour. The estate and the building formed a part of the summer residence of the rulers of Shahpura, who reside here and are your gracious hosts. The 40-acre estate was granted by the Mughal emperor Shah Jahan to their ancestor Rajadhiraj Sujjan Singh in 1630 AD for successful military campaigns against the Marathas and Afghans. 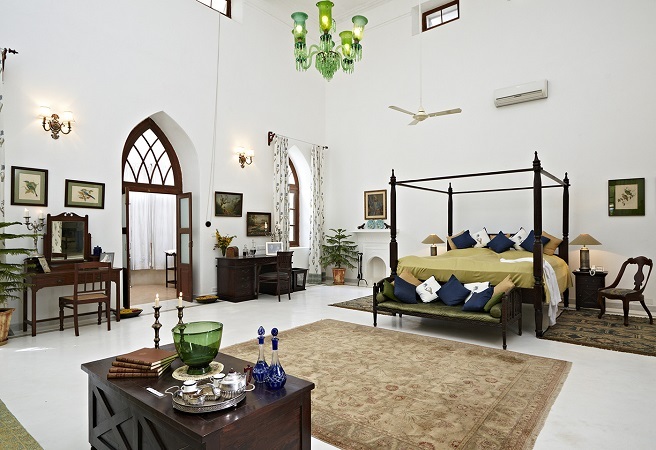 The 5 Royal Suites and 4 Suites in Shahpura Bagh are spread between two residences - Nahar Niwas and Umed Niwas. 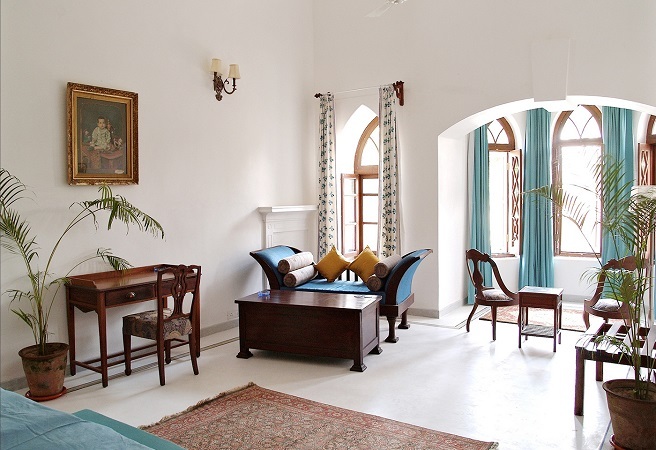 Nahar Niwas is also the family residence which also has the private dining, lounge and bar. 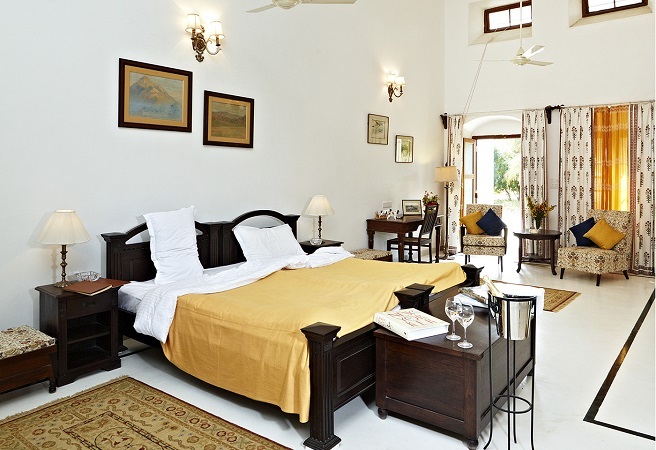 The residences are set in the centre of the large gardens of the estate, the surrounding woods and the lakes on the banks of which Shahpura Bagh is situated. 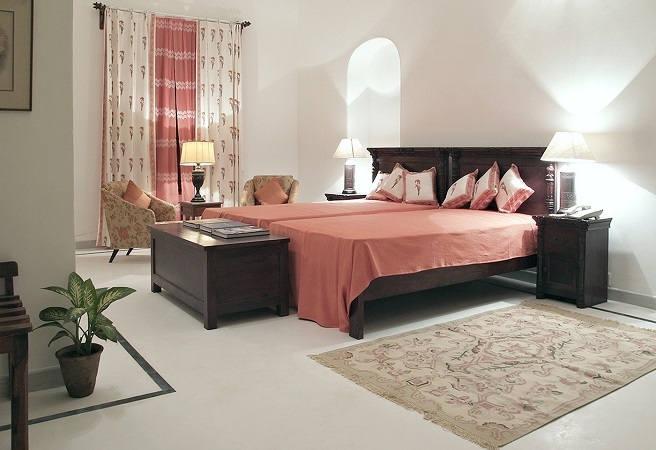 The Suites are air-conditioned , high, generous spaces, furnished elegantly in warm tones of green, rust and brown. The en-suite bathrooms are delightfully large with modern fixtures and luxury amenities. The must talked about swimming pool at Shahpura Bagh is a great hit with sun-worshipers. 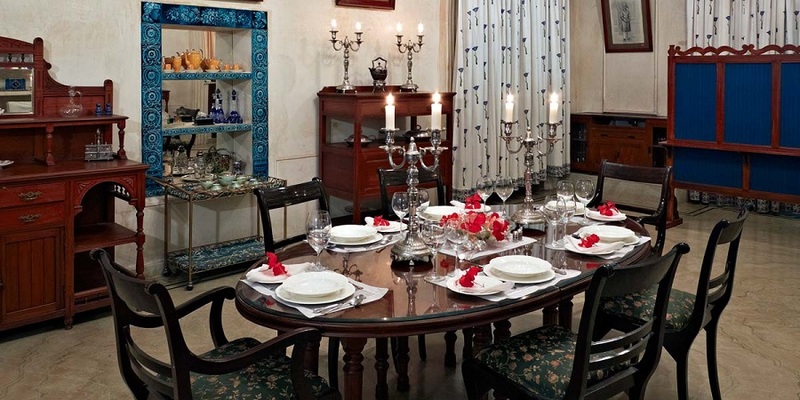 The estate around has many opportunities for alfresco dining while dinners are often in front of Nahar Niwas. 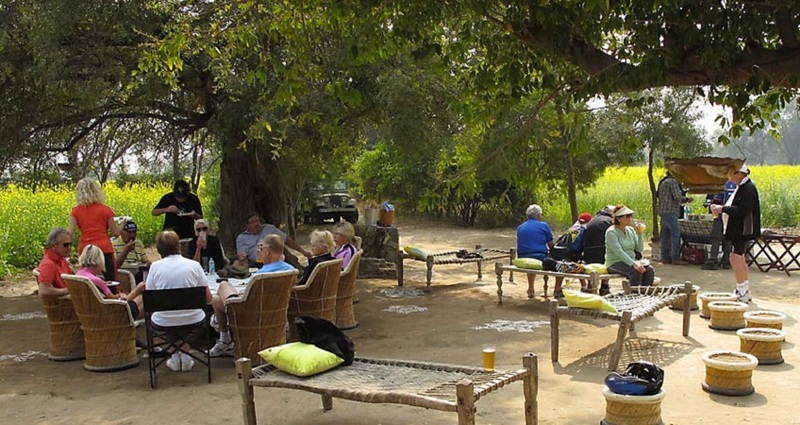 Shahpura Bagh is run with a gentle and unobtrusive hospitality. 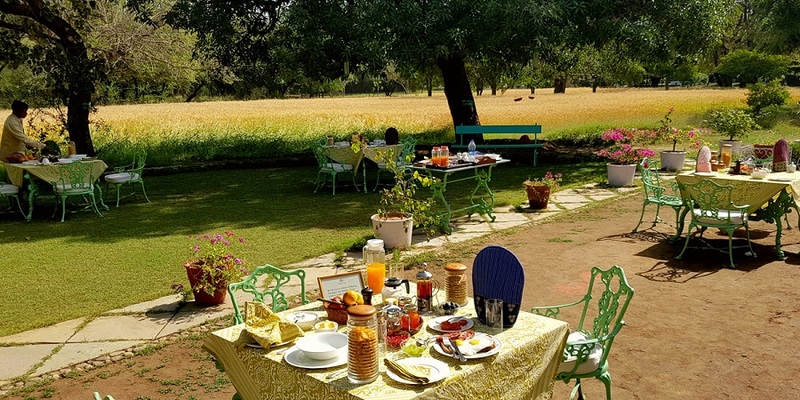 Maya and Sat who live at Shahpura Bagh with their Uncle (the reigning scion of Shahpura), aunt and mother, create an air of natural country living of which the guest becomes a part of. Cuisine is signature, recreated from menus passed down over generations which they can also showcase on request. Sat is a photographer and birder and should you enjoy any of these activities you can rest assured of clever tips on light and composition, and a quick introduction to birds that the estate is teeming with. Shahpura Bagh has initiated and is involved with many development and restoration projects like at the local school, promoting projects such as education of girls etc. The town of Shahpura is very colorful and atmospheric and is a photographer’s delight. 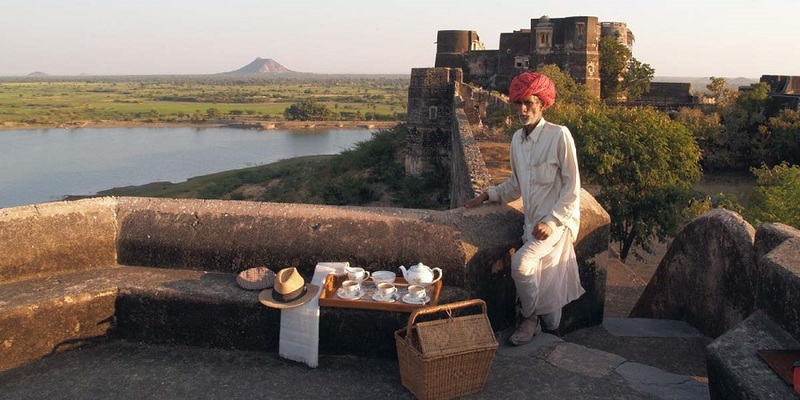 The old fort of Dhikola was where the family originally ruled from and it forms a part of an evening drive and sunset point for tea and snacks on the fort ramparts. A high point from where you can look around for miles including the sight of the village winding down for the day. Shahpura has a wonderful connection with the ancient art of ‘Phad painting’. Infact the Joshi family, probably the last family of artists who paint these life size canvases depicting the stories of mythology and folklore are from this region. An absolute gem in the heart of rural Rajasthan, we can't recommend this property highly enough.